At this time, the indicator will come on. 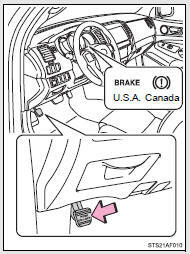 (Depressing the pedal again releases the parking brake.) At this time, the indicator will come on. 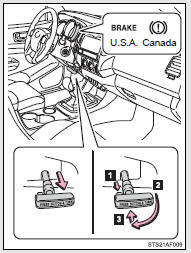 *:Fully depress the parking brake pedal with your left foot while depressing the brake pedal with your right foot. The buzzer sounds to indicate that parking brake is still engaged (with the vehicle having reach a speed of 3 mph [5 km/h]).